Oppolite Hydroponics CO2 Regulator Emitter System with Solenoid Valve Flowmeter for Grow Room Grow Tent Green House Aquarium by Oppolite at Community Greenhouse. MPN: 4332693761. Hurry! Limited time offer. Offer valid only while supplies last. High quality CO2 regulator made from precision instruments. Designed for grow rooms and green houses to enhance CO2 to the growing environment. A must for optimum plant production in high light intensity gardens. MATERIAL: Made from precision instruments, with flow gauge and industrial solenoid valve and high quality brass construction. 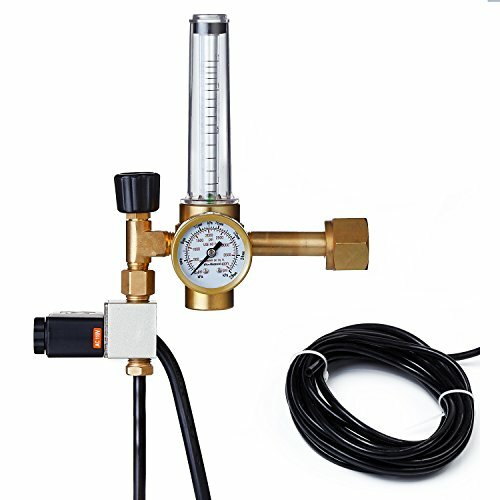 SPECIFICATION: 1.58" high pressure gauge: 0-4000 PSI. Flowmeter: 0-15 scfh. Inlet connection: cga-320. COMPONENT : With 5 meters free plastic tubing and USA standard plug. Hose tail suit for 4.2 mm inside diameter hose. GREAT OPTIONS: This CO2 Regulator will allow you to maintain ideal CO2 levels for optimal growth.